I have a fun week planned for you! After today, I will be focusing on picture books for the rest of the week, so if you have little ones, I hope to recommend some cool titles for you. But today, I’m going to focus on Manga Classics. 1.) I have a limited number of each title, and I like to offer student choice, but getting the students the title that they would like to read is never a struggle since their tastes differ. For example, here are the titles that I have in my classroom. In parenthesis are the percentages of students that selected that book as their first choice (51 students): The Jungle Book (31.4); The Count of Monte Cristo (15.7); Great Expectations (9.8); Sense and Sensibility (0); Les Miserables (13.7); The Scarlet Letter (19.6); and The Stories of Edgar Allan Poe (9.8). As you can see, with the exception of a few Jungle Book selections, the majority of students were able to read their first choice, and the ones that did not get The Jungle Book, received their second choice. 2.) Choice is imperative when it comes to book selection. I would say that a lit circle of these books in the classroom is much more valuable than a class set of one of these books. While my students said that they would have read any of the books I gave them, they LOVED the ability to research what the books were about and make their own choice. We spent an entire period researching and selecting the books; it created ownership and student investment which was well worth the period I gave up. Did you know that the original novel of Great Expectations has 544 pages, the original Count of Monte Cristo has 728, and Les Miserables is close to one of the longest novels of all time with 1,400 pages! I had seniors, in an elective class, most suffering from senioitis, finish those stories in two-three hours. But how well did they comprehend the stories, Mr. Kallenborn Smarty-Pants?! 4.) Comprehension was better than you’d expect. For the books (most of them) that had a twenty-five question, end-of-book quiz on Sparknotes, I had the students complete that quiz. The average for all of the quizzes is a 78%: a solid “C”; however, when they wrote about the novel, you would not know that they did not read the original. And here’s a fun fact, the highest quiz of the lot was Les Miserables (the longest traditional novel of the group) with an 88%…that’s a 1,400 page book read in two-three hours at 88% comprehension. How impressive is that? 5.) The main reason for the successes with these Manga Classics is student engagement. When asked to rank enjoyment of the book on a 1-10 scale, out of 51 responses, 84% rated their enjoyment of the book a 7 or higher, with 66% rating their chosen book an 8 or higher. The kids were being honest. They had no reason to lie, and I have faith in my ability to create a classroom of trust and partnership. 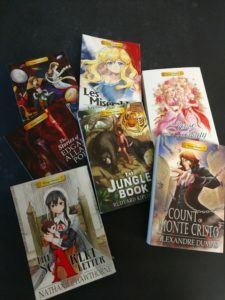 My next post on these Manga Classics will focus more on project and assessment ideas, but I hope what is here encourages and inspires you to try some graphic novel adaptations in your classroom! And as always, let me know how I can help. And always remember to take your own data! Share it with me, so I can help you share it with the teaching community.